Signing Bateman is an important upgrade for us as we rebuild our team... He can play in all situations and will make the players around him better. With AHL experience, he knows what it takes to get to the next level and will pass those skills on to our younger players. One of the key cogs in the Tommies offence for the past 3 seasons, Bateman had better than a point per game average in both playoffs and regular season for the Green and Gold. Jeff's AUS career was unfortunately cut short with a leg injury suffered in last year's Pete Kelly Cup tournament. 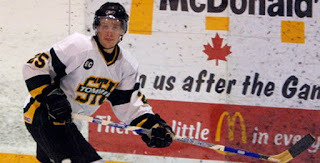 Jeff's career totals with the Tommies: 23 goals and 51 assists for 74 points in 63 regular season contests; 1 goal and 13 assists for 14 points in 11 playoff games. He led the Tommies in scoring in the 06-07 season (13-23-36) and led the team with a remarkable 1.8 point per game pace and +11 rating in his abbreviated 07-08 campaign. Jeff quietly went about his business for the Tommies, performing at a high level and making those around him better hockey players, while unfortunately never receiving the accolades he deserved in the way of official award recognition by the AUS. Rest assured, Jeff is appreciated by Tommies fans who have enjoyed watching him at the Beav. Going to miss your presence at the LBR. Good luck Jeff!!! nice use of my dads picture. Where did you get it from lol?